Designed by Singapore-based Miaja Design Group and inspired by James Bond, it’s certainly fit for a movie star with its crisp, contemporary white design, setting off the glittering blue of the ocean beyond. Here’s a rundown of what guests can expect. ‘Awestruck’ is the word the first guests used when describing their reactions as they stepped off speedboat and seaplane. In true LUX* style, the warmest of welcomes greeted guests, along with Maldivian drumming and dazzling dancers in colourful sarongs. 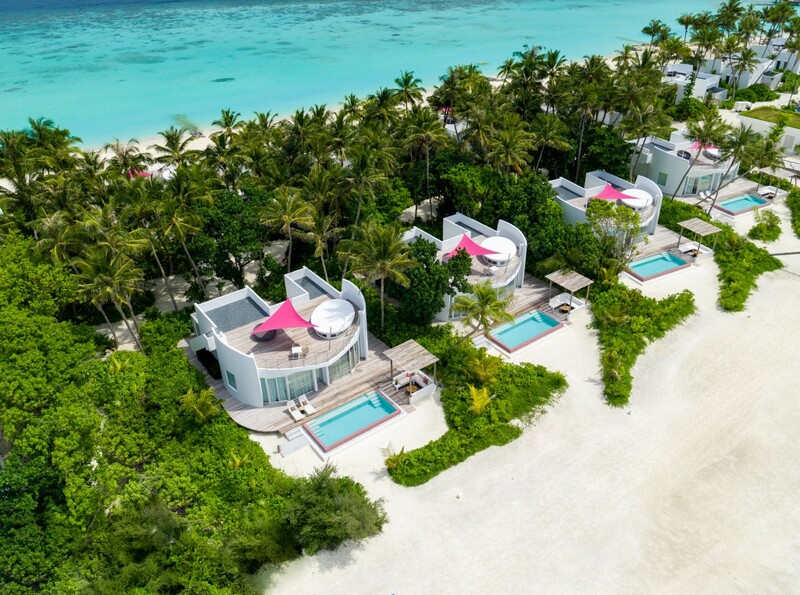 Coconut palms gently arched over pathways leading to the beach and over-water villas, inviting a sense of exploration as discerning guests sought out their private hideaways hidden beyond the hibiscus. Simple yet refined, LUX* North Malé is perfectly planned to offer guests an incredible amount of space, amid sleek pared-back decors in soothing whites, with tasteful touches. 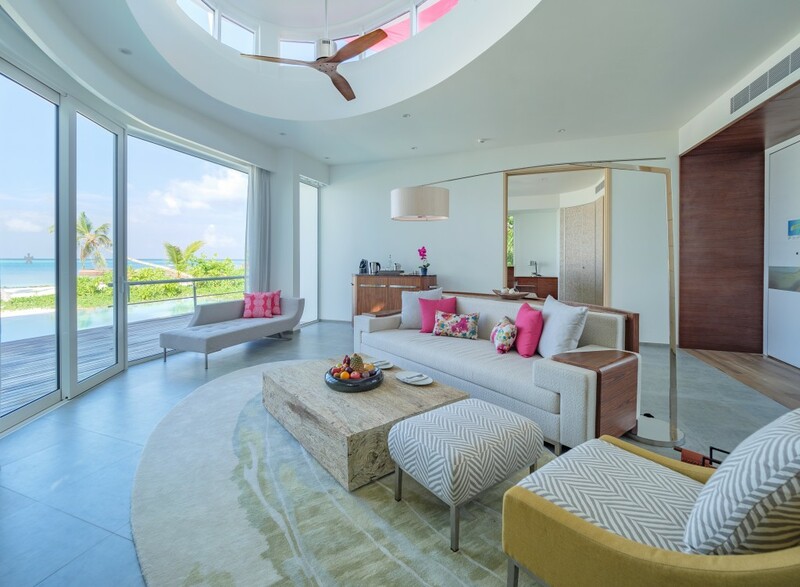 All 67 villas are outrageously spacious, with bathrooms as big as the bedrooms and stunningly spacious outdoor showers. Expansive terraces await, heaven-sent for landmark celebrations – host your exclusive barbecues or a special-occasion party on your own penthouse rooftop. Having so much space to yourselves is the definition of true luxury. Walk the outer loop in less than half an hour. Here on this idyllic isle, villas will feel like your own private world all over again within this soul-stirring tropical setting. Forward-thinking architecture sees windows flung open, tempting you to live life in the greatest outdoors. Every rooftop promises a different perspective on Maldivian panoramas. Look out from up higher at that big blue expanse — the only movement you’re likely to see is birds swooping into the foliage or dolphins rippling the water’s glossy surface. The Indian Ocean’s palette is never predictable and always enthralling. In that always-summery sunshine, the sky and sea can be a deep, deep blue. In the evening, that same landscape is resplendent in pastels — snap a vivid orange sunset one night and the next admire purples and violets. Stroll pure white sandy beaches and beautiful shells insist you pause to admire them. Step out from any edge and go snorkelling and tick off tropical fish from a lengthy checklist. Dolphins, stingrays and turtles are among the characters in this thriving reef, brought to life by the on-site marine biologist. Floor-to-ceiling windows and first-class therapists are features of the LUX* ME spa set along its own jetty. On the opposite end of the island to the buzzing beach club, it’s a corner of complete calm where views are only ever interrupted by elegant long-winged birds gliding across the horizon. Flower-filled gardens are framed by trees stretching over as though in graceful yoga moves. Those who like their luxury served with kindness and care, be assured this resort is sensitive to the environment, conveying where it can that life us best lived with a conscience. There are no single-use-plastic shockers or disposable containers — we pride ourselves on refillable glass water bottles and ceramics for the highest-quality amenities. Check out the boutique and spy only sustainable fashion brands. Playful but sophisticated, fun but finessed — the world-renowned vibe of a LUX* resort is infectious. 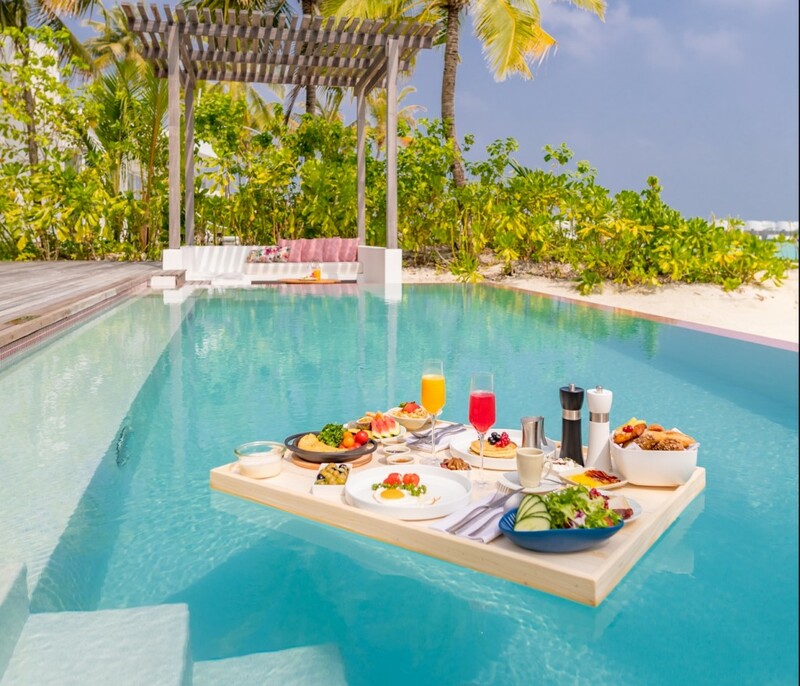 Time at LUX* North Malé Atoll is free of fixed schedules. Stand-up paddleboard when the mood takes you, or be whisked away to a secret sandbank for sunset cocktails. Pad around the island to find ICI for an exotic house-made ice-cream. Or charter a superyacht and let the captain chaperone you to Turtle Point, a sanctuary for marine life. Every moment here matters. Rates start from $1,456 AUD per double room accommodation villa per night on a Bed & Breakfast basis (excluding taxes, service fee & transfers). 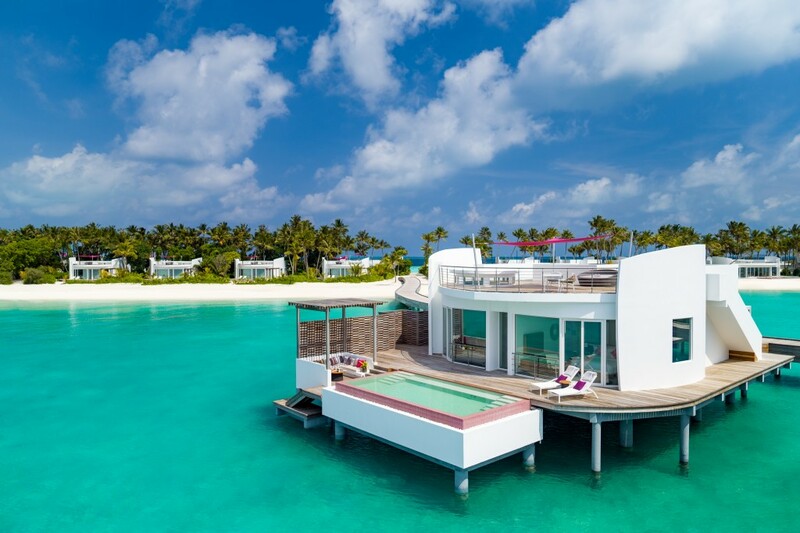 We are positively DROOLING over this collection of Maldivian resorts. However, that could also be because we stayed up all night watching re-runs of the Bachelor. Meanwhile, we’re trying to boost eco-friendly practices in our office by slapping single-use coffee cups out of our colleague’s hands. They’ll thank us once the burns heal.